This book is created in memory of blacksmith Dave Ferguson. David Ferguson was in the tool and die business for 25 years and love to work with metal, especially Damascus. David had a very strong desire to see the art of blacksmithing continue and not be lost to future generations. He studied blacksmithing with Paul Hubler at Paul's smithy in Minnesota. 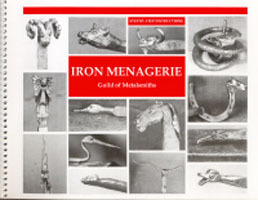 The book was written to fill a need for developing blacksmithing skills in creating decorative fantasy animal heads. All projects in this book were hammered out by Blacksmith Paul Hubler. Book details how to make steer heads, a blue crane, a duck head, a wolf head, a ram head, a buffalo head, a bear head, a mouse head, an owl, a horsehead, a horsehead on a horseshoe, an eagle, a rattlesnake and a wizard head. The contributors to this excellent book are Paul Hubler, Bob and Mary Fredell, Marcia McEachron, Pete Stanaitis and Gary Crowther.